Nothing is quite so striking as a Ferrari. Especially when the world is used to Camry’s and Minivans. I was reminded of this as I ran into(not literally) a childhood dream car over the weekend. It was a Red on Red Ferrari Testarossa. It has the updated 512TR wheels, but it was classic Testarossa. And I was lusting after it in spite of it’s many flaws. Is it too wide for everyday use? Yes. Does it overheat if left idling on a lukewarm day for more than a few minutes? Most certainly. Do these quirks add character? To me, they do. I rolled down my window as the light turned green and listened to him lightly drive away. The V12 wasn’t singing, but it was still there, just enough to get me giddy. 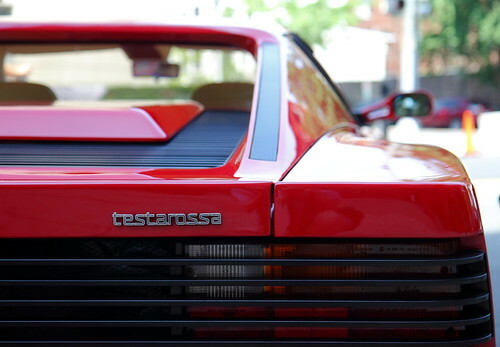 The Testarossa was the first Ferrari that really drove my imagination wild. I would grab a pencil and design cars that could use it’s motor as the center piece. Granted I was 5 or 6 at the time, so they were mainly wedge-shaped masterpieces with a screaming V12. They of course had the side strakes to pay homage to the car the motor came from. Those fins along the side also inspired many body kits that mimicked it. However, there’s nothing quite like the original “red head”. When it hit the Mags in ’83….it was off the charts. When replaced…..the new 550 Maranello’s V12 was just not the same. Something about the Boxer Flat 12 in a Testarossa that was magic. Have you seen the values on these lately? Hmmmmmm and if I sell this and trade that, I can get into an early Testarossa for cheaper then a couple year old Lexus.